One of the nations that occupied Palestine at the time of the invasion of the Israelites. In the list of the sons of Canaan, the Jebusite occupies the third place, between Heth and the Amorite (Gen. x. 15, 16; I Chron. i. 13, 14). This is also its position in Num. xiii. 29; in Josh. xi. 3, however, the Jebusite is mentioned between the Perizzite and the Hivite. On the other hand, in the oft-repeated enumeration of the tribes that occupied the land of Canaan, the Jebusite comes always at the end (Gen. xv. 21; Ex. iii. 8). The Jebusites, stated to have dwelt in the mountains (Num. xiii. 29; Josh. xi. 3), were a warlike people. At the time of Joshua's invasion the capital of the Jebusites was Jerusalem, called also "Jebus" (Judges xix. 10, 11; II Sam. v. 6), whose king Adoni-zedek organized a confederacy against Joshua. 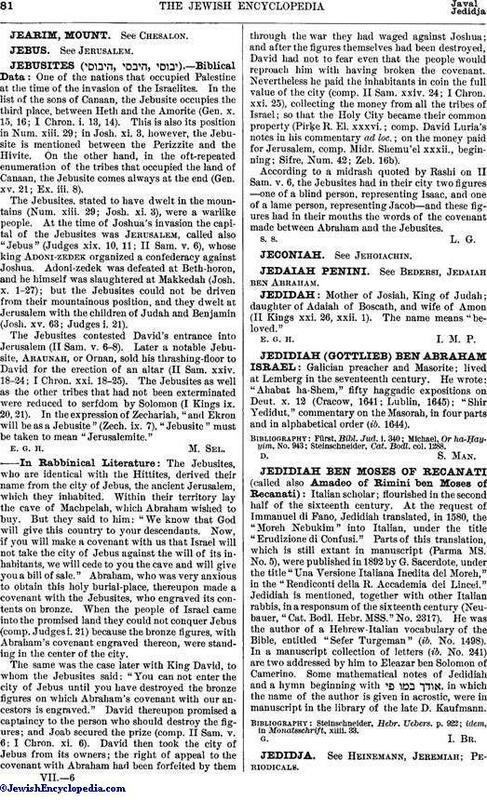 Adoni-zedek was defeated at Beth-horon, and he himself was slaughtered at Makkedah (Josh. x. 1-27); but the Jebusites could not be driven from their mountainous position, and they dwelt at Jerusalem with the children of Judah and Benjamin (Josh. xv. 63; Judges i. 21). The Jebusites contested David's entrance into Jerusalem (II Sam. v. 6-8). Later a notable Jebusite, Araunah, or Ornan, sold his thrashing-floor to David for the erection of an altar (II Sam. xxiv. 18-24; I Chron. xxi. 18-25). The Jebusites as well as the other tribes that had not been exterminated were reduced to serfdom by Solomon (I Kings ix. 20, 21). In the expression of Zechariah," and Ekron will be as a Jebusite" (Zech. ix. 7), "Jebusite" must be taken to mean "Jerusalemite." The Jebusites, who are identical with the Hittites, derived their name from the city of Jebus, the ancient Jerusalem, which they inhabited. Within their territory lay the cave of Machpelah, which Abraham wished to buy. But they said to him: "We know that God will give this country to your descendants. Now, if you will make a covenant with us that Israel will not take the city of Jebus against the will of its inhabitants, we will cede to you the cave and will give you a bill of sale." Abraham, who was very anxious to obtain this holy burial-place, thereupon made a covenant with the Jebusites, who engraved its contents on bronze. When the people of Israel came into the promised land they could not conquer Jebus (comp. Judges i. 21) because the bronze figures, with Abraham's covenant engraved thereon, were standing in the center of the city. The same was the case later with King David, to whom the Jebusites said: "You can not enter the city of Jebus until you have destroyed the bronze figures on which Abraham's covenant with our ancestors is engraved." David thereupon promised a captaincy to the person who should destroy the figures; and Joab secured the prize (comp. II Sam. v. 6; I Chron. xi. 6). David then took the city of Jebus from its owners; the right of appeal to the covenant with Abraham had been forfeited by them through the war they had waged against Joshua; and after the figures themselves had been destroyed, David had not to fear even that the people would reproach him with having broken the covenant. Nevertheless he paid the inhabitants in coin the full value of the city (comp. II Sam. xxiv. 24; I Chron. xxi. 25), collecting the money from all the tribes of Israel; so that the Holy City became their common property (Pirḳe R. El. xxxvi. ; comp. David Luria's notes in his commentary ad loc. ; on the money paid for Jerusalem, comp. Midr. Shemu'el xxxii., beginning; Sifre, Num. 42; Zeb. 16b). According to a midrash quoted by Rashi on II Sam. v. 6, the Jebusites had in their city two figures—one of a blind person, representing Isaac, and one of a lame person, representing Jacob—and these figures had in their mouths the words of the covenant made between Abraham and the Jebusites.